More than 100 people, mostly tea estate workers, were killed after drinking toxic bootleg alcohol in the north-eastern state of Assam in India. Of the dead, atleast 25 were women, said a report, citing senior officials. The deaths occurred in Upper Assam’s Golaghat and Jorhat districts. According to official sources, 59 of those who died were from Golaghat while the remaining 43 were from Jorhat. At least 25 women were among the dead. The first incident was reported from Salmara Tea Estate. Two Excise officers have been suspended with immediate effect. Two people involved in making country liquor have been arrested, reported PTI. One-man commission has been formed to conduct an inquiry into the incident. Upper Assam Commissioner Julie Sonowal will conduct an inquiry and submit the report within 30 days. 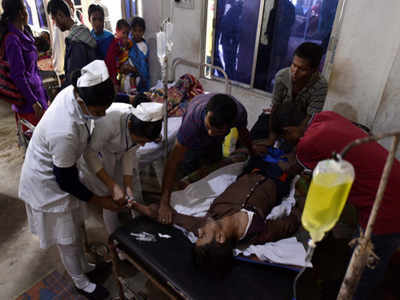 The deaths come days after tainted spirits killed about 100 people in the northern states of Uttar Pradesh and Uttarakhand. An inquiry has been ordered into the tragedy. Golaghat district Superintendent of Police Pushkar Singh told BBC that police had found the home where the toxic liquor was made and had recovered one and a half litres of it. "I had bought half a litre of wine and drank it before eating. Initially, everything was normal, but after some time my head started hurting. The headache grew so much that I could not eat or sleep," he added. He felt restless until the morning, and started getting chest pain. His wife then took him to the tea plantation hospital, and he was referred to the district hospital, said the report.